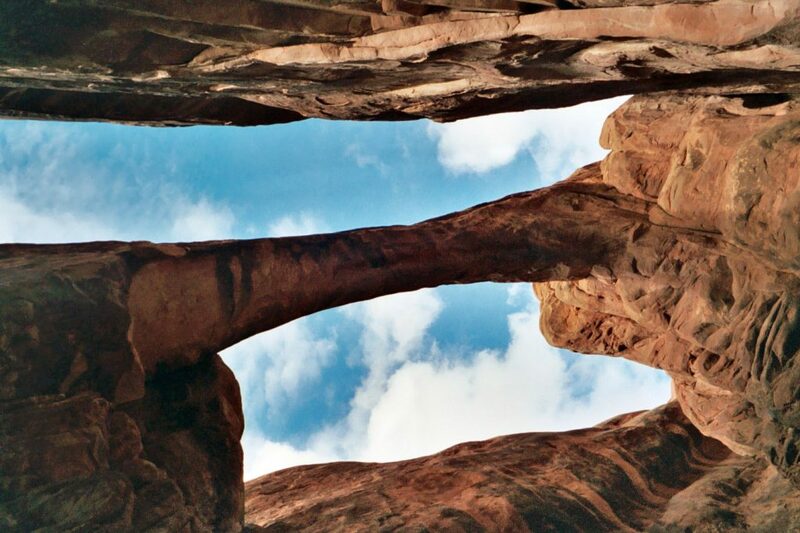 These great Arches National Park Hikes put you right in the middle of the world’s highest concentration of natural sandstone arches with over 2,000 arches identified within the park. It is no longer a hidden gem within the National Park System either. 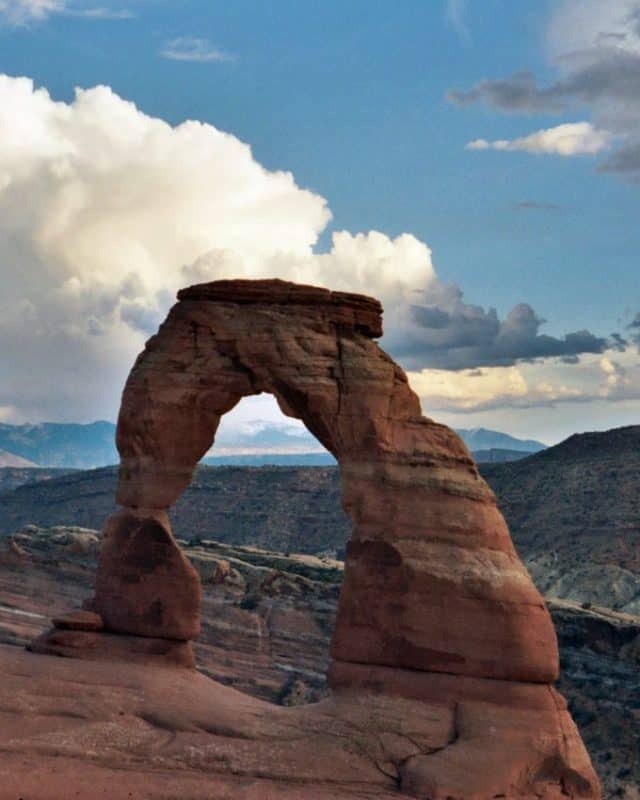 Photos of icons like Delicate Arch have led the general public to fall in love with Arches and has made it one of the most visited National Parks in the United States. You can anticipate a line to get into the park and full parking lots once you do get in. The Arches National Park hiking trails will be full of people and there will be photographers jockeying for the perfect spot to get their favorite photograph to take back home and show their friends. It is also common to see several international tourists making the trek to Arches as they too have seen photos of this magnificent place. You may ask yourself if it is worth going? I will tell you the answer is without a doubt Yes! I have visited Arches several times and hiked the best hikes in Arches National Park and have come up with my list of 7 Epic Hikes in Arches National Park. Park Avenue is the first trail you will run into after entering the park. This is a moderate trail with epic views of monoliths, The Three Gossips, Sheep Rock, The Organ and Tower of Babel! You can make this a one-way 1-mile hike if you have someone that can pick you up at the Courthouse Towers Viewpoint. Delicate Arch is more than an arch, it’s a symbol of the American Southwest! This arch replaced Utah’s Olympic Winter Games license plate and has been easily recognized as the symbol of Utah ever since. This is also one of my most memorable hikes! It is considered a difficult trail for a good reason. It’s not just the distance and elevation gain/loss, it’s because you will be hiking on the exposed slick rock with the Southwests weather the whole hike is done with absolutely no shade. I personally will never forget the moment when I walked around the rock wall and saw Delicate Arch! It all but took my breath away. I stood in amazement soaking in the moment. When I came back to my senses I noticed the sheer number of people and the whole one side was nothing but photographers fighting for position for the perfect shot. For a fun perspective go to the lower Delicate Arch overlook. Here you will see what looks like hundreds of ants climbing up and around the arch. Upon closer inspection, you will notice it is all the hikers that have made their way to Delicate Arch. The Devils Garden Hike is not your typical hike where you go to see a single destination. 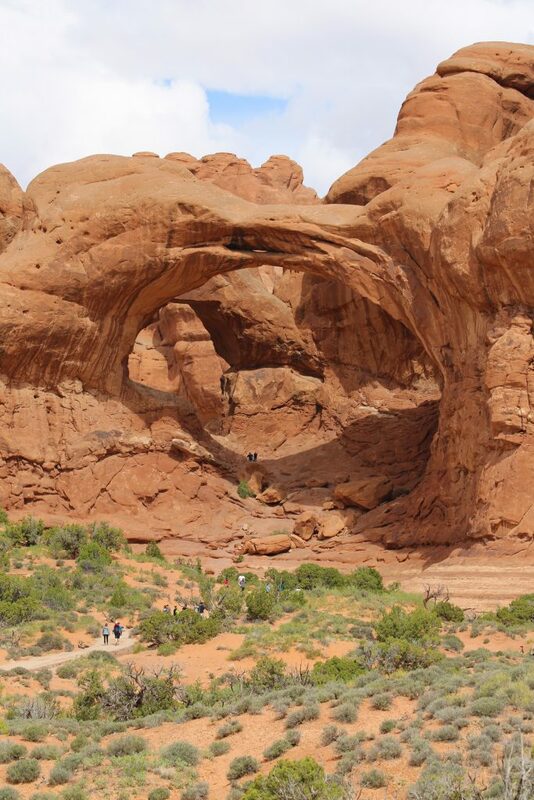 This incredible trail has seven Arches including the famous Landscape Arch and Double O Arch. 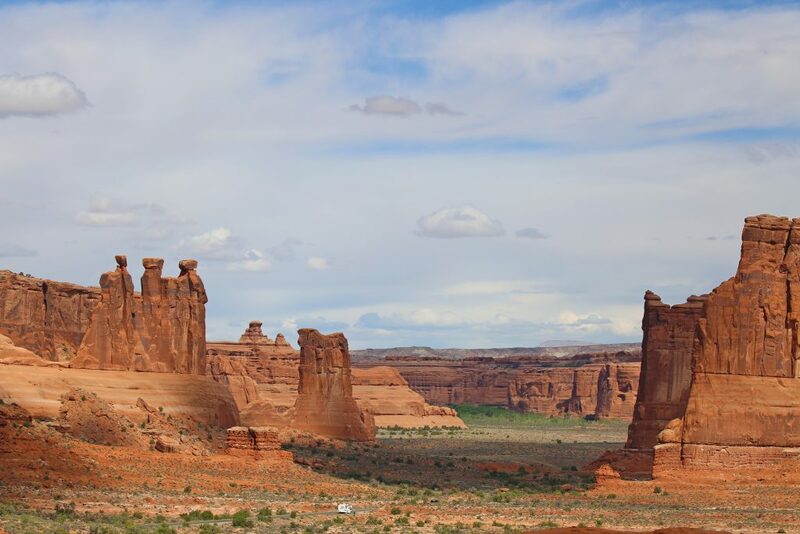 You can also hike to the 150-foot sandstone tower named Dark Angel and a primitive loop where you can hike amongst the fins that will someday become future Arches. Devils Garden is a difficult trail and should not be attempted when the rock is wet or icy. The trail becomes more challenging after passing Landscape Arch at .8 miles with narrow ledges, scrambling up the slick rock, uneven trail surfaces, and exposure to heights. You can go as little as a half mile or hike the full loop depending on what you want to see and do just make sure you show up early as the parking lot will fill up. Sand Dune Arch is an easy hike from the parking lot. It is still enough to get your blood pumping as it is a slight uphill climb in the soft deep sand. If you want to take a longer hike you can also hike to Broken Arch then to Tapestry Arch located just behind the Amphitheater in the Devils Garden Campground. 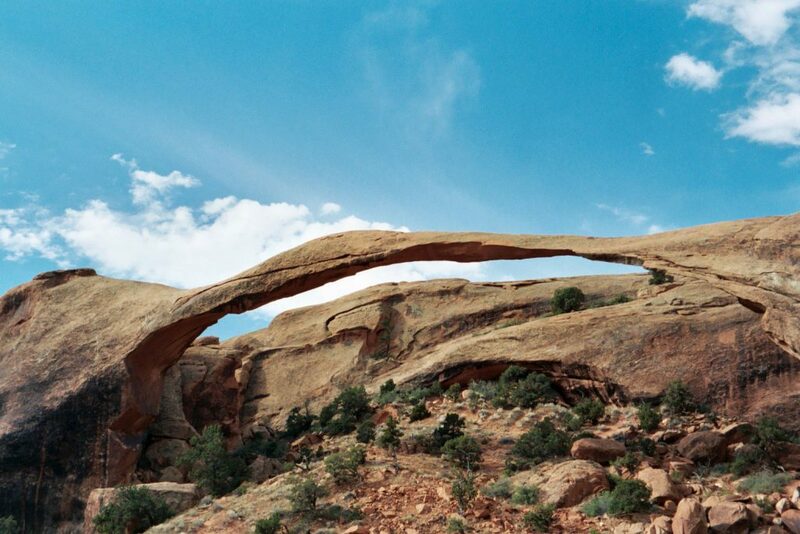 The Windows area of Arches includes Turret Arch, North Window, South Window, and Double Arch. Most people recognize this section by the famous photograph of Turret Arch seen through the North Window. This is a nice 1-mile hike with incredible views! My personal favorite is Double Arch. Each time I see this arch I start humming the tune from the opening of Indiana Jones and the Last Crusade. The opening scene started here however the cave and railroad do not exist. 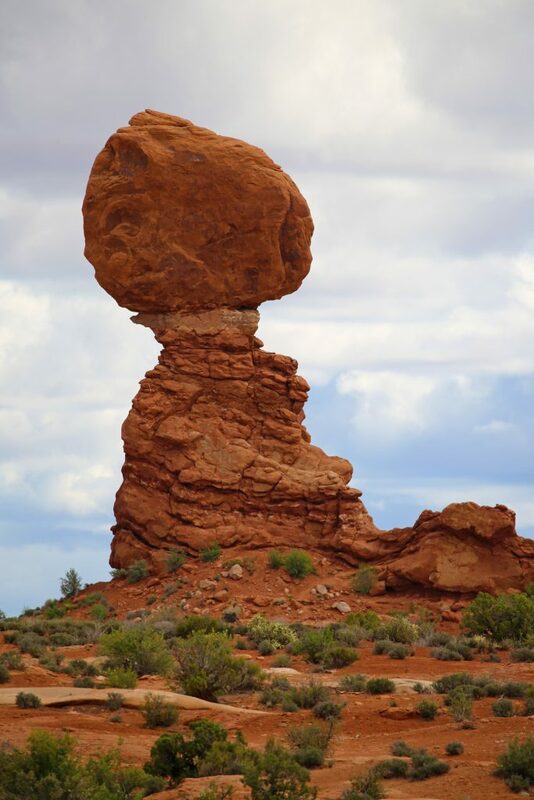 You can easily see Balanced Rock from the road and many people simply drive past it taking photos from the window of their moving cars, seriously you can see people doing this from the trail! It’s a pity because this short .3-mile paved loop gets you up close and personal to this rock. It feels like you are flirting with danger standing below while this rock is perched on top and looks like it could fall at any moment. 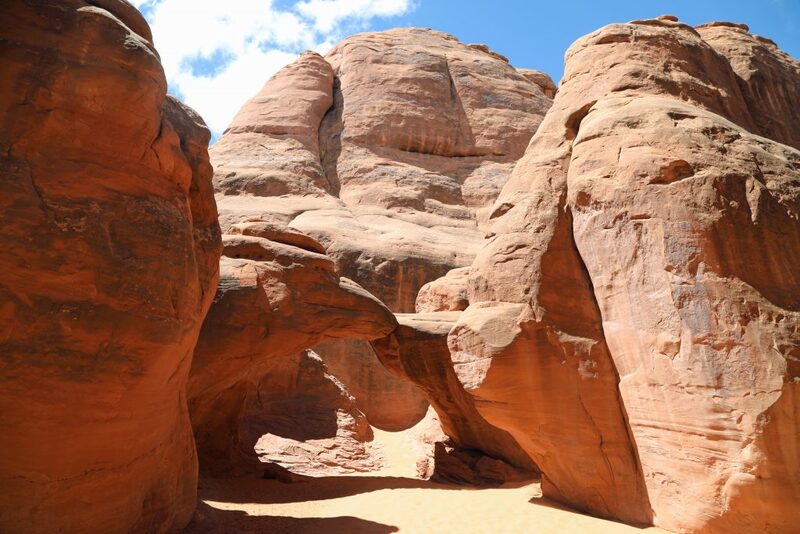 The Fiery Furnace is an incredible labyrinth of narrow sandstone canyons. There is no trail here so it is strongly recommended to take the Ranger-led tour. You can obtain a day use permit to enter the Fiery Furnace on your own but it is easy to get lost and you could easily miss the highlights of this incredible area of Arches NP! I loved the Ranger Led hike and would recommend it to anyone! It gives you the thrill of exploring an area without trails but make sure you choose your steps carefully as this area requires agility and scrambling. This is not an exaggeration, it is a trail for the thrill seekers needing more than a hike! My personal highlight was laying down and looking up at Hidden Arch. 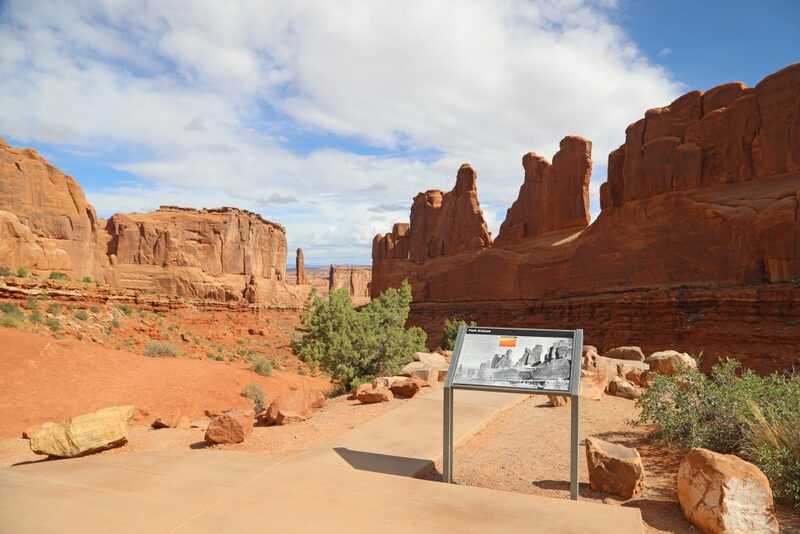 There are many more trails within Arches to explore but the reality is that most people only spend an average of four hours in a National Park. If there is ever a park to spend more time, Arches is one of them! 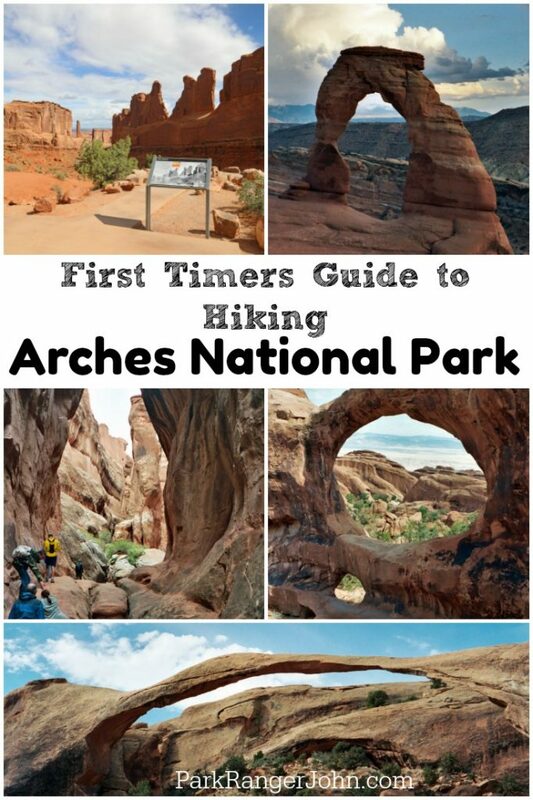 I guarantee you that you will be dreaming of your next visit to Arches NP and your desire to try out each of my 7 epic hikes in Arches National Park! Are you planning on camping in Arches? We wrote up this guide to Arches National Park Camping to help make planning your trip easier! Traveling to Utah? Check out all of the Utah National Parks to help plan your trip. From Arches, it is a quick and easy trip to check out Mesa Verde. If you are heading that way check out these Mesa Verde Travel Tips. Do you know how many National Parks you have visited? You can print this list of National Parks in alphabetical order to count how many of the 59 parks you have visited. Wonder what it is like to work in a National Park? Check out this post on how to become a Park Ranger to learn a bit more about what it takes to be a Park Ranger. 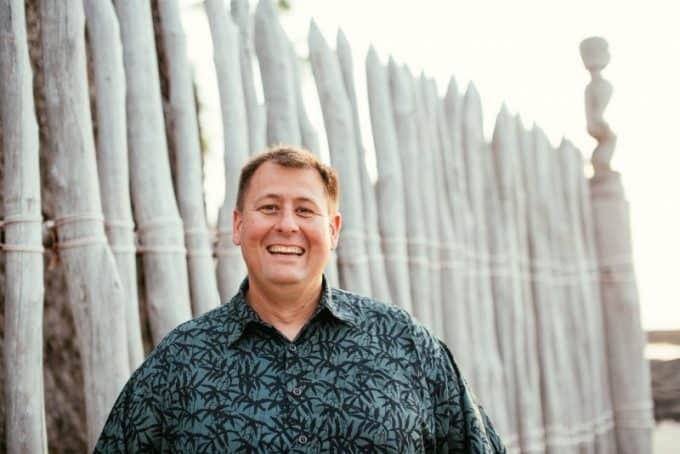 Loved both the Zion and Arches articles, John! We plan on visiting both next year; expect to be in that area beginning of April. Thanks so much for the valuable information on all the trails, arches, and hikes Park Ranger John! My husband and I will be visiting here in October of 2018. This information has put in to perspective what we need to train a bit more for versus what might be an easier trail. Thanks again! We have been told to have a guide take us to “Devil’s Cauldron”, but can not find this reference anywhere on the Arches National Park site. Can you help us? Our friend suggested a guide because the trails are not clear and as hikers we would not find the safe way to go. We’re going to be in the Park 10/15-18 (3 nights).